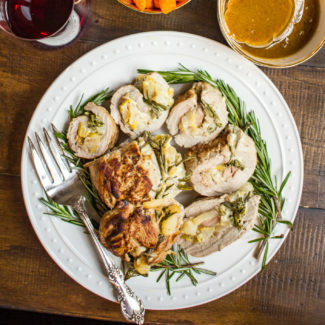 Don’t want to cook Thanksgiving dinner? Lucky for you there are lots of Chicago restaurants serving Thanksgiving and/or offering Thanksgiving take out! 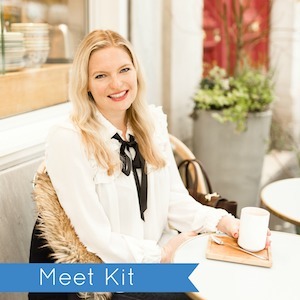 And just because I love my readers, I rounded up a list for you! Chicken Shop is marinating all natural Amish turkeys for 48 hours and then slow cooking them in the rotisserie, and making all the sides you love. Orders need to be placed by November 17th by emailing EDNChicago@sohohouse.com. 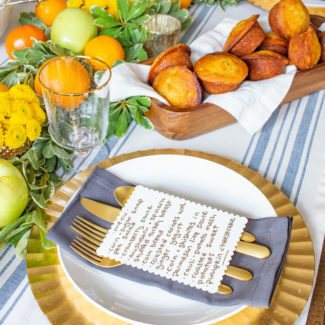 Goddess and Grocer has an extensive Thanksgiving Catering Menu. You can order items a la carte – or get a full meal for 12 people for $395. Pre order by November 20th at noon. 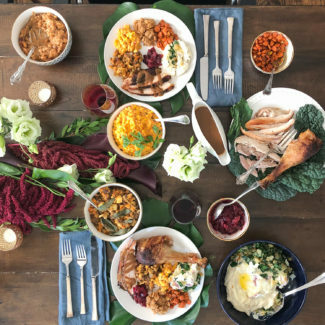 Bub City is offering a whole smoked turkey, homemade cornbread & sage stuffing, mashed potatoes, classic gravy, cranberries and an autumn salad – enough for 10 guests – for just $150. If that’s not enough, order additional add-ons like large sides, vegetables, smoked meats and pies. Pre-order by Wednesday, November 25; pick up Thursday morning, November 26. Frontier is offering 15 pound smoked turkeys for $75 and 20 pound smoked turkeys for $95. Place your orders by Monday, November 23 and pick up on Thanksgiving day between 9am and 12pm. Side dishes including a five-cheese mac, potato salad, sweet potato puree, and string beans are available too. County Barbecue is smoking up fresh, farm-raised turkeys to go. These 12-14 pound birds feed 12-16 people and are being sold for $70 each. Sides are available for $10 per quart. Place your order by Saturday November 21 and pick up on Tuesday November 24th or Wednesday November 25th. Bub City will be open the whole day and celebrating with Thanksgiving specials and Late-Night Karaoke. 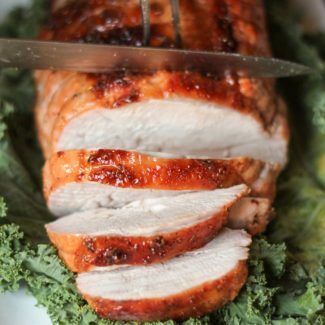 Enjoy several menu favorites like General Joe’s Chicken and Giddy Up Fries, or dig into the Smoked Turkey Platter featuring a hickory-smoked turkey breast, homemade roasted garlic-and-sage stuffing, creamy mashed potatoes, classic gravy and cranberries ($17). Stop in day-of or call ahead to reserve your table. Rural Society is serving a $55 prix fixe menu on Thanksgiving from 12-8pm. 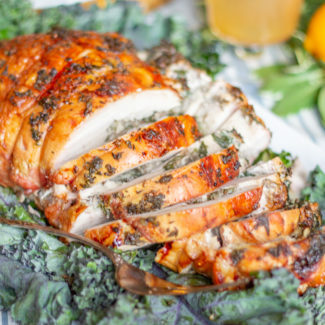 The menu includes turkey three ways (oven roasted leg, smoke breast, grilled thigh), brioche stuffing, creamed potatoes, and brussels sprouts plus appetizers and dessert. Rural Society’s space is perfect for large groups too! Del Frisco’s Double Eagle Steakhouse will offer a special $52 3-Course Thanksgiving Menu. 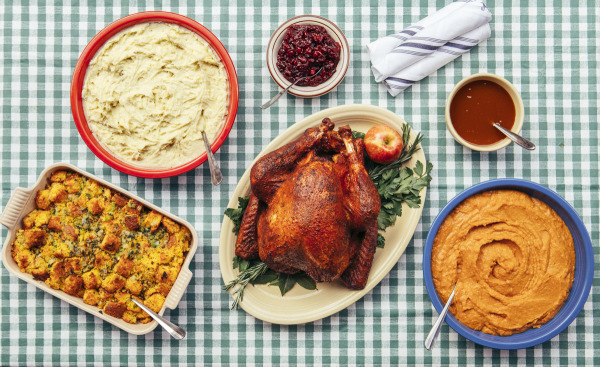 Dinner starts with soup or salad, and is followed by a traditional Thanksgiving dinner with slow roast turkey, stuffing, mashed potatoes, green beans, gravy, and cranberry relish. Pick wither pumpkin cheesecake or pecan pie for dessert. The full regular menu will also be available. The Langham is creating an elaborate and varied food spread for Thanksgiving. Classics like roast turkey, gravy, stuffing, and sweet potato casserole will be served up along side New York Strip Steak, Alaskan Snow Crab, Oysters and sushi. The desserts sound incredible – there will be a a crêpe station, tarts, éclairs, petit fours, cakes, macaroons, cookies, and candies. Seating times are 12pm, 1:30pm, 3pm, and 5pm, the cost for adults is $135 and children are $50. Filini is serving a four-course Italian Thanksgiving from 5-10pm. The fun thing about this dinner is that there is a pasta course! In addition to a choice of Roast Turkey and Prosciutto Wrapped Stuffed Pork Loin, you can have Pumpkin Gnocchi with Italian Sausage, or Cheese Ravoili. Dinner starts at $80 per person, or pay $95 to include a wine pairing. Deca at the Ritz Carlton is hosting a Thanksgiving Day Brunch Buffet from 11am-5pm. 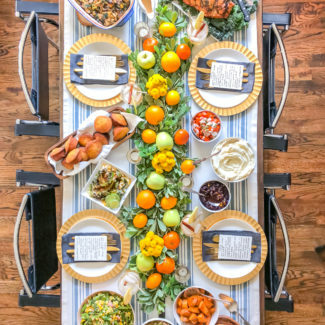 Sage Rubbed Roast Turkey, Bourbon Glazed Yams, and Fennel Chicken Sausage will be served along with buffet tasting stations. Brunch tickets are $135 for adults and $35 for children, and a limited a la carte menu will also be available. Mercat a la Planxa is offering a Spanish inspired three course Thanksgiving feast. Start with a salad with house smoke salmon, or truita de patata, and then try the turkey with razz clam stuffing and sherry pan gravy. The prix fixe menu is $75 and dinner will be served from 3pm until close. The Signature Room is the place to dine while giving thanks for Chicago’s amazing skyline. Their Thanksgiving buffet includes traditional roast turkey, stuffing, and gravy, plus roast pork loin, prime rib, custom salads, king crab legs, and charcuterie. Gluten free and vegetarian options are available too. Dinner is priced at $80 for adults and $35 for children.